What is We Talk Dog Training & Coaching? Most issues with dogs can be summed up in one statement: “They don’t understand their place in the pack.” The purpose of our training is to help YOU establish the rules for your “pack” and help you understand and maintain that leadership role. Our focus is on you ﬁrst, and the dog second, giving you all the tools and knowledge to manage your dog’s behavior. How Does It Work? We Talk Dog training is a training program that has evolved over many years of hands-on experience. A LOT of training has gone into this, as well as lessons from some of the greatest trainers out there. Training is not a quick ﬁx. Our experience has shown us that personally working one-on-one yields faster and far greater results in the shortest amount of time. To begin training, we start with a phone consultation with someone from the WTD training team. Depending on your situation, we can do this through phone calls, dog evaluations at We Talk Dog and in-person/dog consultations. 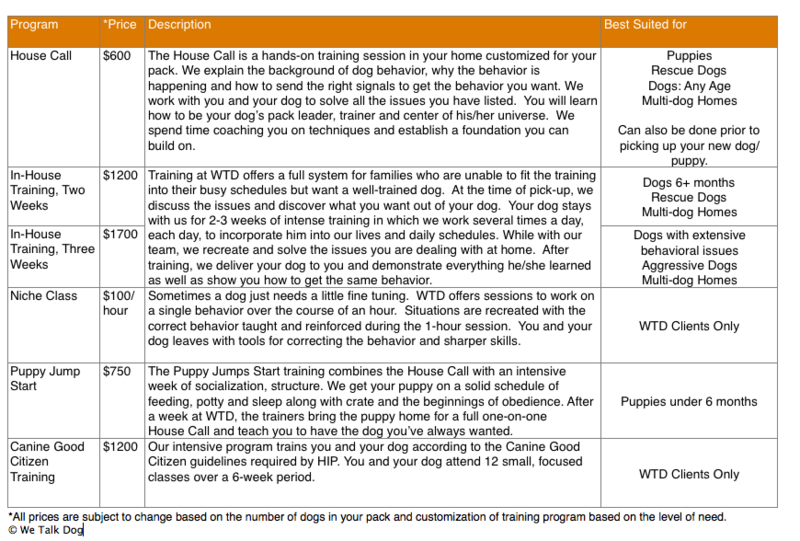 We will recommend a customized training program based on our evaluation of the pack leader, the dog and pack needs. Our training programs involve coming to your home in one form or another. 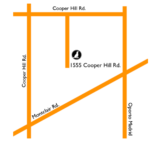 We make House Calls to your pack (the dog’s “territory”) to help you where the dog is having issues. We set the foundation on which you will begin to build on during the House Call. Our trainers’ set short-term goals for your pack with homework and support. We come check on weekly progress and once goals are met, we keep building. Some dogs need more help getting on the right track than others. For these situations, we offer a training option where the dog comes to stay at our facility for at least a two week period. While at We Talk Dog, the dog works with our training team several times a day to meet the owner’s goals, and also gets the beneﬁt of daycare, supervised socialization, structure, and consistency. Following it’s stay, trainers bring your dog home and spend time with your pack. We outline the goals met with the training, demonstrate what the dog has learned and coach you on pack leadership. These training options include leashes and training collars, informational packets and a DVD, as well as the assurance that we are here to help for the rest of the dog’s life! Do You Want To Learn To Talk Dog? We are happy to help get your pack on the right track! Whatever behavior problems you may be experiencing with your dog, it is important to know that with our help, these problems can be corrected. Remember: our training is a program, not a quick ﬁx. But with all of our experiences, in all the different situations, we will help you in anyway we can, from starting out on a good puppy schedule to dealing with the major aggression cases. We want you to have the best dog in the world for you, we personalize everything to you and your own situations.